I am the first to admit that I don't diet. I hate the thought of something or someone dictating what I eat. When I was pregnant with my second child, I developed gestational diabetes and had to follow a *gasp* DIET. Ended up having to follow the GD routine during my third pregnancy, too. 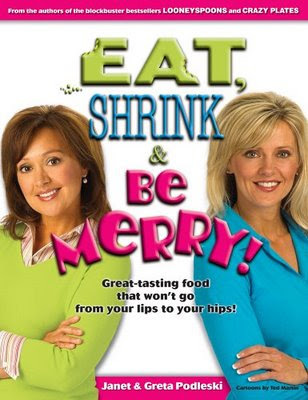 I was recently given this book to borrow, and although I wasn't initially interested, Eat, Shrink & Be Merry is a fun book! Full of information and written in an easy-to-read style filled with plenty of humor, the book would inspire anyone to cook a bit more healthily! Some examples of the recipes (and humor) are: Rome on the Range (delicious spaghetti and meatball sauce) and Jamaican Me Hungry (yummy grilled chicken). Eat, Shrink & Be Merry also debunks many food myths and mysteries with the "Fat or Fiction," "E-files," and "Pop Quizine" columns throughout the book. Healthy cooking and eating doesn't really mean bland rice cakes and bowls of tossed salad without any salad dressing for the rest of your life. If I had to dislike anything about the book it would be the lack of pictures of the finished recipes. I enjoy cookbooks with pictures, don't you?? The picture itself is what often inspires me to read the recipe! Eat, Shrink & Be Merry only has one picture per food category (appetizers, soups, side dishes, etc). So, aside from the photo absence, if you get the chance to pick up a copy of the Podleski sisters' book or check it out at your local library, I think you just may start cooking up a healthy meal or two! Click here to check out Sweet Kitchen's take on Janet & Greta's chicken wings. I love Janet and Greta's recipes. While I totally agree with you about the pictures and could do without all the puns, the recipes themselves are really good and I don't think of this as diet food but as healthful eating. Thanks for the shout-out!